Yep I ve been tagged and although I love the concept, I dont normally respond to them not because I m a boring git but because I m never sure of who to tag next, as everybody seem to have already been tagged, so what I m gonna do from now on is I m gonna play but not gonna nominate people, so if you are reading this and you have not been at it, please consider yourself tagged by me.. HA! HA! 1. WHAT WERE YOU DOING 10 YEARS AGO? 2.WHAT WERE YOU DOING 1 YEAR AGO? Pretty much the same, working in my local Post Office and craft in every spare minute. 3. NAME YOUR 5 FAVOURITE SNACKS? 4.NAME 5 THINGS YOU WOULD DO IF YOU WERE A MILLIONAIRE? Each year i choose to support 2 charities, so I would save myself the headache and give to them all equally. 5.NAME 5 THINGS YOU LIKE DOING? 7.NAME YOUR 5 FAVOURITE TOYS! Ok so i ve got a card to show you, I ve made it for Sarah one of my team mates over on UKS, I just hope she liked it I do feel blessed for being part of such a nice team of girls. I ve used the In the Spotlight hostess set rose red and old olive cardstock, versamark, pumpkin pie, rose red and old olive ink, old olive wide grosgrain ribbon, and the swiss dots cuttlebug folder, scallop punch and 3/4" punch, a jumbo eyelet and crystal brads. 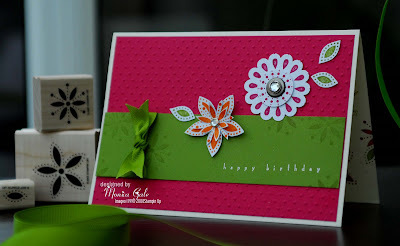 I adore the simplicity of this card and the colours are just yummy together. This was a quick post, i ve got some more cards to show you tmrrw., I ve been working on them for a swap I m holding on UKS.so keep your eyes on this blog. 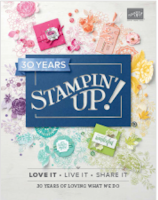 hugs and stampin kisses See ya!!!! Hi thanks for the insight into you! The card is lovely - look forward to seeing the rest tomorrow! 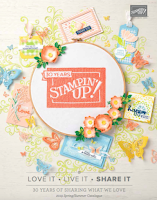 Gorgeous card - I have got to get some more Cuttlebug embossing folders soon!